I don’t think I’ve ever tried posting a Vlog! But I’m going for it today! If you’re having trouble convincing your kids to get on-board with healthier eating…I get it! Been there. Done that! My kids did not react well when I told them I would no longer be buying hot dogs or chicken nuggets at the store. That’s not to say that they will never eat them again. I am all for special occasion allowances. However, I just don’t add these items to my grocery list anymore! I’ve found ways to substitute healthier alternatives, for the foods that they love. And of course, it’s a work in progress! We are always looking for new foods to try! The wonderful thing is that the kids are so much more aware of the foods that they eat. They read labels just like I do! And that makes my heart go pitter-pat! So here is my vlog! What do you think? 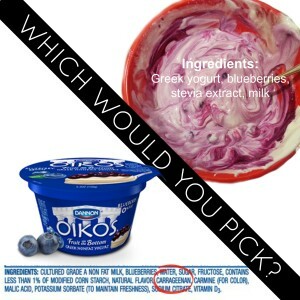 Which yogurt would you pick? Carrageenan is an ingredient that you will find in some yogurts, soy milk, ice cream, etc. It’s added to make foods thicker, creamier and to create a ‘fuller’ feeling to low-fat foods. The problem is that carrageenan could be causing inflammation, gut irritation and even cancer. Beginning in the 1960s, researchers started linking the ingredient to gastrointestinal disease in lab animals, including ulcerative colitis, intestinal lesions, and colon cancer. Make sure you scan your labels! If you see the “c” word…RUN! My weekly meal plan is FULL of healthy recipes and family-friendly foods! I’ll send it to you every week for FREE! Sign up below!